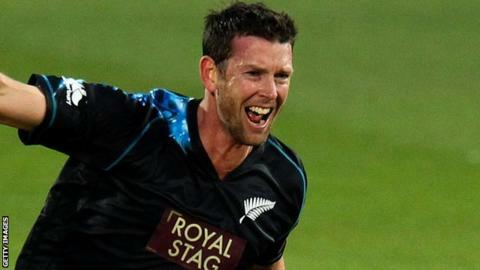 Northants have signed New Zealand bowlers Ian Butler and Neil Wagner. Former Gloucestershire and Nottinghamshire paceman Butler, 32, is available for both Championship and T20 matches until late July. Left-arm seamer Wagner, 28, will play in the final five Championship matches after New Zealand's tour to the West Indies. The signings come after deals for Jackson Bird, Rory Kleinveldt and Sohail Tanvir fell through. "We're really pleased to have both of those guys on board," Northants captain Stephen Peters told BBC Radio Northampton. "We've been after extra hands on deck. Wagner is a really competitive bowler, gets stuck in. "Butler's been bowling in the nets, he's here. The way things have gone with overseas signings I may have preferred to announce Wagner when he's actually here." Butler has played eight Tests, 26 one-day games and 19 T20 matches for the Kiwis, taking a total of 75 wickets. Wagner has appeared in 14 Tests, taking 50 wickets at an average of 35.00. Northants are back in Division One of the Championship for the first time since 2004, but are struggling after one draw and two defeats. But the Steelbacks are the reigning T20 champions, after their victory over Surrey at Edgbaston last year.